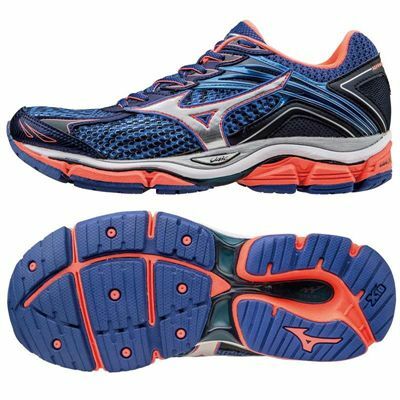 The Mizuno Wave Enigma 6 are high-cushioned ladies running shoes providing a soft fit and feel and effortless, floating runs. Featuring AIRmesh technology in the upper, these lightweight trainers ensure great ventilation and have Dynamotion™ Fit system for a comfortable, adaptive fit. There is U4ic and U4icX foam in the midsole for improved softness and responsiveness, as well as Mizuno Wave® technology for a cushioned and stable feel. Soften your running routes with these stylish, eye-catching and well-cushioned shoes offering SmoothRide outsole for a fluid ride and energised, euphoric runs. Comfortable good quality shoes. I'm only doing short distances at the moment but hope to get up to marathon training soon so will see what the durability is like then. At the moment there is a spring in my step and no aches from impact. Not loving these shoes; heavy, hot and quite an inflexible sole. This is a really comfortable supportive shoe. I completely forget about my feet once I'm running as they are so comfortable and so well supported that I can run for miles on tarmac. I love this range of Mizuno running. for submitting product review about Mizuno Wave Enigma 6 Ladies Running Shoes.